The prayers noted on Tibetan Buddhist prayer flags are blown by the wind and are said to spread good will; thus, benefiting all. When I press the publish button each week, my posts are blown to the electronic universe with the intention of helping others pay attention to their own needs, find the best within themselves and be the best they can be. Each post is a guide to forward thinking. This post marks my one-hundredth, and seems like something worth celebrating in a year of moving forward. With that in mind, let’s move this website forward each week. When you receive a post, spread the word and pay it forward. In other words, spread the word by telling someone about It Is What It Is and ask them to pay it forward as well. A simple way to do this is to click on the envelope with the arrow or one of the share chicklets (buttons) at the bottom of each post. 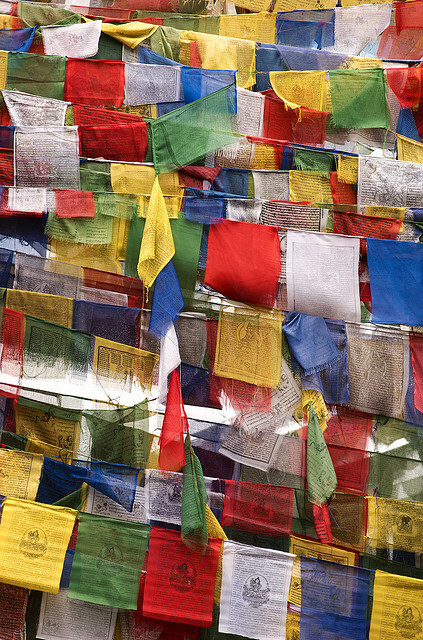 Be the wind to my prayer flags, share the love and guide someone to forward thinking.